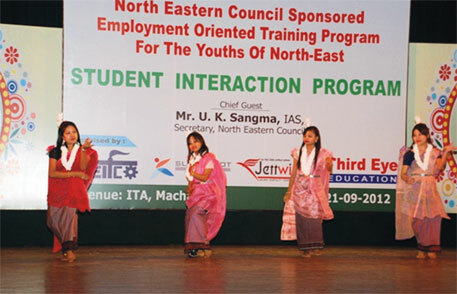 Northeast is perhaps the only region in India where economic development is considered so crucial to national security. The region is showing signs of normalcy after 65 years of separatist insurgencies. This is the reason the National Security Advisory Board (NSAB) has recently expressed concerns over the continuing slow pace of development in the Northeast despite the Centre pumping huge amounts of funds into developmental projects. In an internal report circulated in January, NSAB has cited that the problem stems from confusion over the roles of two Central agencies entrusted with the responsibility of the region’s development—the North Eastern Council (NEC) and the Ministry of Development of North Eastern Region (MDoNER). NEC was constituted in 1972 by a Central Act to supervise development of the region, which was lagging behind other states and mired in ethnic conflicts. It provided a platform to the chief ministers of the eight states—Assam, Tripura, Manipur, Nagaland, Mizoram, Meghalaya, Arunachal Pradesh and Sikkim—to meet periodically to discuss issues of common concern, such as unemployment, inter-state transport, power and flood control projects. The council would then fund projects or advise the Centre or state governments to take up the matter. But in 2001, the Centre created another agency for the region. Established under the Union Ministry of Home Affairs, the Department of Development of North Eastern Region was to coordinate infrastructure projects within the states. This marked the beginning of the confusion and the resulting clash between the two agencies. Making it worse, the Centre in 2002 amended the NEC Act. The department assumed the status of a ministry, MDoNER, and NEC became a planning body under it. Certain important roles, like reviewing the security and law and order situation in the region, were taken away from NEC. “The amendment limits both our purposefulness and powers,” says NEC member P P Shrivastava. The ministry, with its headquarters in New Delhi, virtually controls all the decision-making powers of NEC. “The council has to rely on New Delhi for every single issue,” says B G Verghese, a senior journalist who has written extensively on the region. For instance, NEC faces an acute shortage of manpower, but a proposal for creation of posts in NEC secretariat is pending with MDoNER since 2009. In 2006, following directions of Prime Minister Manmohan Singh, NEC prepared the Vision 2020 document for the region. It was the first exercise of the Centre to seek feedback on development needs from about 250,000 people in the Northeast. However, NEC officials allege MDoNER sat on it for long, ignoring its potential for development in the region. “We are here to fulfil local aspiration but our mandate of regional planning is being underestimated. This ruins our reputation,” says Shrivastava. “Earlier, the roles of NEC were clearly stated. But after the creation of MDoNER, its role, and relation with MDoNER, the Planning Commission and Union Ministry of Home Affairs became overlapped,” says Falguni Rajkumar, former secretary of NEC. He adds that the ministry treats NEC as field agency, ignoring that it has much larger mandate of planning for the region. In 2008, Rajkumar wrote to the prime minister seeking greater clarity on the role of NEC. Pramod Tandon, professor at North -Eastern Hill University, Shillong, who headed the National Advisory Council (NAC) Working Group on Development of the North Eastern Region, questions the role of MDoNER in his report submitted to NAC last year. “Apart from coordinating for funds, the ministry has no separate plan for this region,” it says. Some blame NEC for the confusion. “Conceptually, NEC and MDoNER should not clash and there is no overlap of functions,” says Madan P Bezbaruah, former secretary with the Union Ministry of Tourism, who served NEC in the early days of his career. NEC does not exercise its power and complains only to cover up its inefficiency, he says. Documents available with Down To Earth show NEC has not been able to spend large portions of the allocated funds. 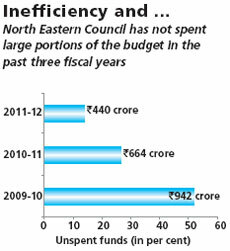 In the financial year ending in March 2012, NEC had Rs 440.38 crore as unspent money covering 267 projects. This was 14 per cent of the funds it received. In 2009-10, almost 52 per cent of the funds NEC received remained unspent (see ‘Inefficiency and ...’). NEC officials blame this on lack of manpower or delay in project finalisation. Whatever the case may be, NEC is losing favour amid the confusion. Officials say the budget of NEC has been diminishing gradually. During the 11th Five Year Plan period, NEC received less than half of the budget approved by the Planning Commission (see ‘Wings clipped’). This time, for the 12th Five Year Plan period, the budget could be much less. “There is a gag order from ministry not to reveal the plan outlay,” says Sherry Lalthangzo, director planning with NEC. But one can gauge the reduction from the first annual plan of the 12th Five Year Plan. 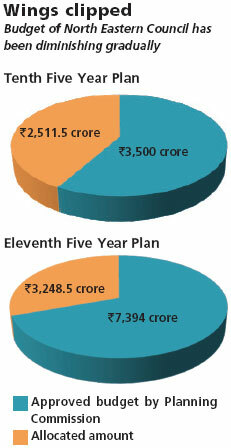 The Planning Commission had initially approved Rs 787 crore for 2012-13. It was later cut down to Rs 770 crore. In June last year, during the 61st meeting of NEC, chief minister of Arunachal Pradesh P K Thungan urged the Central government for increasing funds to the council. The ministry, which also has the role of arranging funds from the Centre for the northeastern region, has no answer for the drastic budget cuts of NEC. When Down To Earth contacted A S Lamba, secretary at MDoNER, he refused to speak on the matter and said joint secretary K Damayanthi should be contacted. Before the amendment, NEC had a larger role than that of a regional planning body, says Sanjay Hozarika, director of the Centre for North East Studies and Policy Research, New Delhi. It virtually provided a political framework that was in sync with the sentiments of regional autonomy and helped resolve contentious issues, he adds. In 2005, the Second Administrative Reforms Commission (ARC) had also recognised the role of NEC in maintaining security in the region. It had recommended winding up of MDoNER and making the Union Home Affairs Ministry the nodal ministry for the region. NSAB’s report also suggests downgrading MDoNER and upgrading the role of NEC. But a role reversal would not serve the purpose unless the two agencies work together on development challenges.